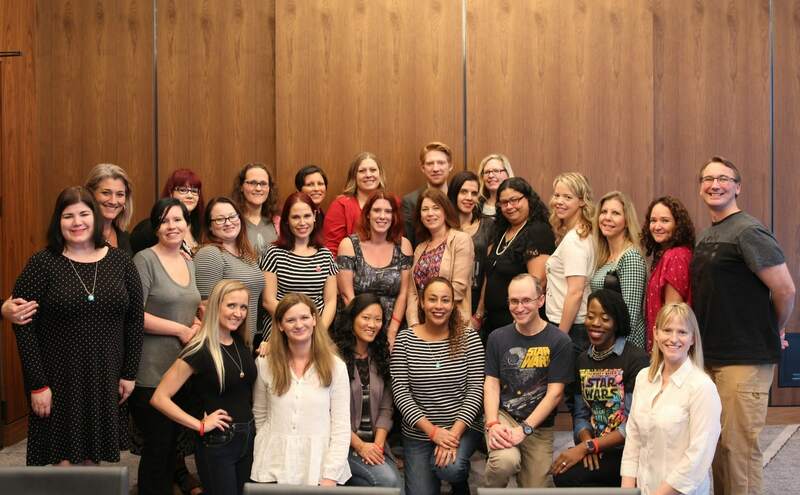 I had the opportunity to interview Domhnall Gleeson while on a sponsored trip for #TheLastJediEvent on the behalf of Disney. While this post is partnered, all opinions are mine. 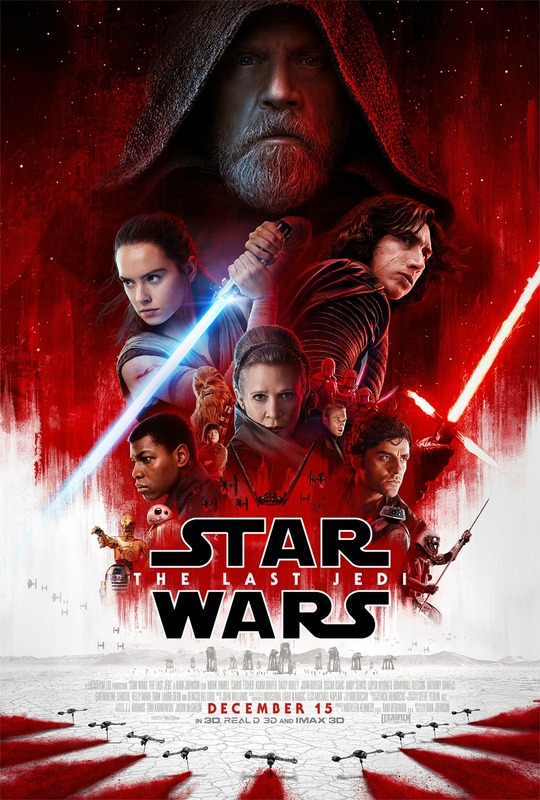 The day is almost here, Star Wars: The Last Jedi is releasing across the county this Friday! 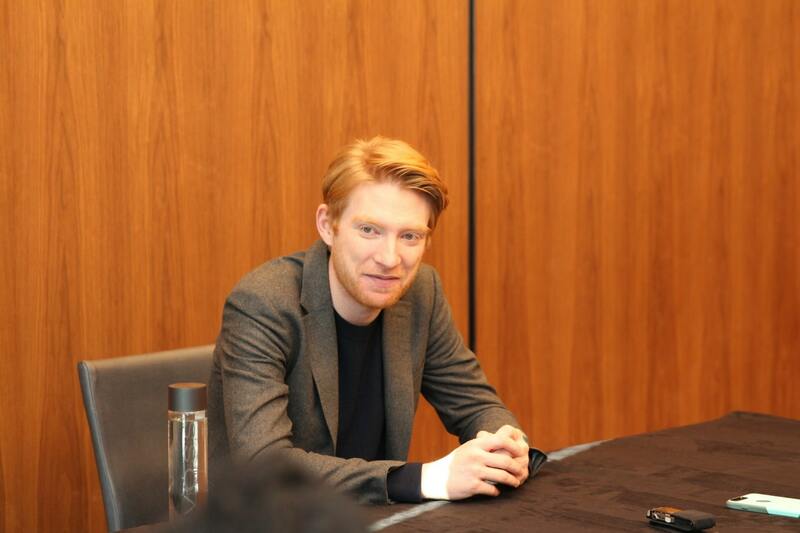 Earlier this month I had the opportunity to sit down with Domhnall Gleeson who plays General Hux in the new film. You may remember him from The Force Awakens… he is one of the bad guys! 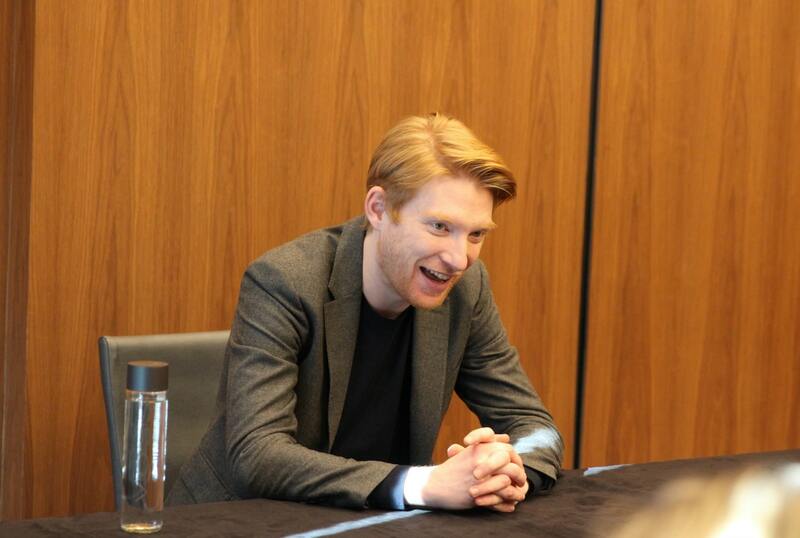 I wasn’t sure what to expect when I first met Domhnall Gleeson, he plays his character so well, maybe he is a little evil too? But as soon as he walked into the room he started joking around with us and I knew that he isn’t a bad guy, he just plays one on the big screen. He was called Cate all the time when he was nineteen because he looked like Cate Blanchett. He had no idea that there was a Disneyland, he just knew about Disney World. He decided not to screen The Last Jedi movie with his fellow castmates because he wanted the experience of seeing The Last Jedi with his family and friends. He loved all the whoops and hollers at The Force Awakens premiere. He was a huge fan of Harrison Ford in Indiana Jones. (He didn’t watch the Star Wars trilogy until he was being cast in The Force Awakens). He is a character in, not one, but two extremely popular ride attractions at two different theme parks. I didn’t include that Domhnall Gleeson is from Ireland, but I bet you already knew that! In fact, parts of The Last Jedi were actually shot in his home country! While he wasn’t apart of those scenes he was pretty excited that they had the chance to experience Ireland. I love it. I love that the people who went there had an amazing time. I love that they got good weather. I love that they were all the way up and down the west coast, and Ireland is my home, I think it’s the best place in the world, and I’m just happy for people to see it. It’s an intensely beautiful place, and they got to see it in intensely beautiful weather, which is ridiculous. That never happens. So when they came back and they were all talking about what a good time they had in Ireland, even though I had nothing to do with that, I have to say I was pretty, pretty proud. Star Wars: The Last Jedi General Hux (Domhnall Gleeson) Photo: David James ©2017 Lucasfilm Ltd. All Rights Reserved. 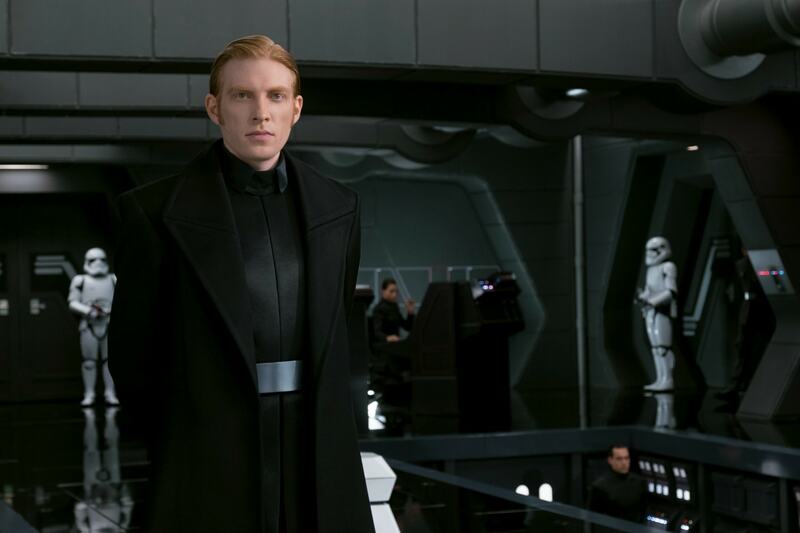 In the second film, General Hux finds himself in a much worse place than he did in the first film. He knows that Kylo Ren could crush him with a flip of his wrist. Domhnall talks about his characters arc across the films. The character arc in the first film, he goes from a very good place to a very bad place in terms of his standing in things…I think it’s pretty obvious, he wants his place on the throne. He wants to be in charge of Kylo Ren as a opposed to, like, whenever Snoke goes, that’s what Hux wants. And so that’s what he would like. But he’s in a really much worse place at the end of the first movie than he was at the beginning in terms of achieving that goal. That’s where we basically start the second movie, so, just in terms of an arc, you’re just starting the character in a much worse place. A much more desperate place, much more uncomfortable place, and I think that’s a good place to put somebody like Hux… Taking a step back from him and thinking objectively, you want Hux to suffer. That is what you want for somebody who behaves like that. Domhnall has a much different presence about him than his character. We asked about how he channeled this for his character and ultimately find the character that he wanted to portray. He reminded us that we all have our dark moments. I think, even less than, or more than rage, I think there’s a desperation about him, which is very unbecoming. There’s a need at all times to make sure that everybody knows that he’s important; that they should do what he says, that he deserves his position in things. But he knows that he’s now as powerful as Ren, really when it comes to it. If it came to a first fight, he’s dead within ten seconds. And Ren wouldn’t have to use his fist, he’d just like force choke him or whatever. That’s where he is at all times, so you just try and think about – just put yourself in a desperate place, and then say, right I’m getting rid of that, and now I’m pretending that I’m powerful, even though something in there is worried that you’re not. I think insecurity is where he, those are not solid foundations, you know? And that’s where we tried to start him from. Being apart of something on the scale of Star Wars has to be cool. 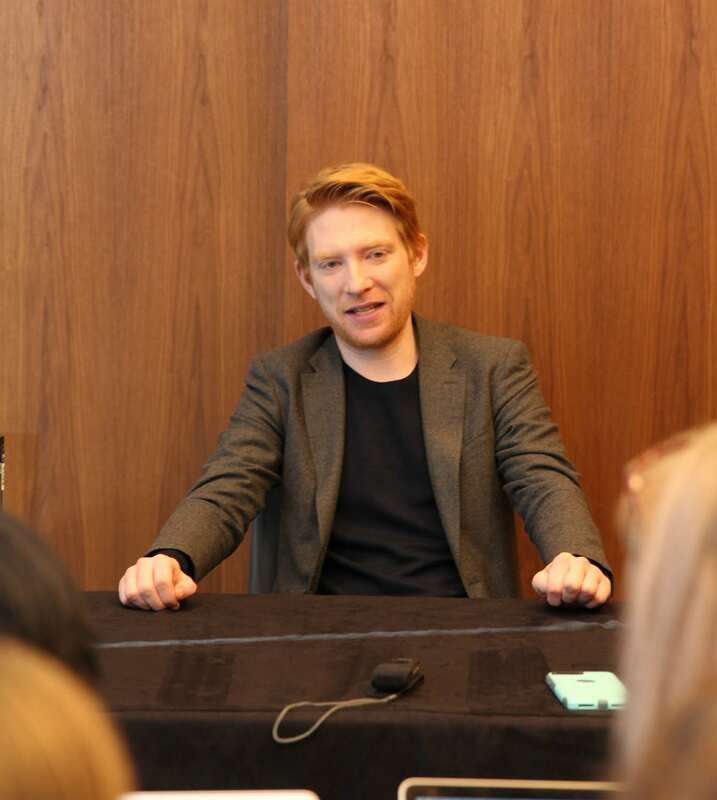 We asked Domhnall if he had any “Geek Out Moments” when filming. There are so many things which are part of growing up, which are part of people’s childhoods. Star Wars would have been the first movie that a lot of people, you know what I mean? Like all those things. There’s just something that’s a position of privilege, so loads of moments like that. Any time, without giving anything away of who I worked with on this or didn’t work with, but when you’re on set, other people have to come on set to show Rian a costume in person, or, you know, to talk to him about something. So the days when you don’t know somebody’s gonna be in, and you’re kinda talking to Rian about something and then Mark Hamill just stoles up in his Luke Skywalker gear, you’re like what the f-. You’re like, oh my gosh… Those moments, when you’re not expecting them, and he’s there on a Star Wars set and you’re like, what are you doing in the evil place? Why are you hanging out here, and it’s like, oh he just here to see Rian. Like, those things are kind of amazing. Those where you pinch yourself. We all have our dark moments, you know, everybody has those, and those moments when you remind yourself that you should be a person than what your instinct to do is or whatever, that there are other people. I think generally, hopefully I’m not that bad about remembering that the good of the people is more important than the good of your own thing, which obviously these days is getting trampled all over all over the place, hopefully I’m not to e- I’ve never killed anyone! Maybe I should add that last fact to the list! Be sure to revisit tomorrow when I share my final interview from the global press event with Kelly Marie Tran (“Rose Tico”). If you missed any of our interviews be sure to catch up with Laura Dern (“Vice Admiral, Amilyn Holdo”), Gwendoline Christie (“Captain Phasma”), and the Entire Cast of The Last Jedi including director Rian Johnson. Also be sure to check out my time at the global press event. Star Wars: The Last Jedi releases on December 15th.